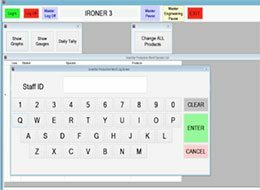 Production floor operators logon via touch-screen, swipe card, or biometric reader, to the assigned item of finishing equipment including the processing lane (if applicable) and select the product type to be processed. The operator�s name is displayed on the display monitor. Targets (benchmarks) are displayed for the selected product type. The operator begins the finishing process. At any time, an operator can “pause” production so that data integrity is maintained. The reason for a pause is selected. 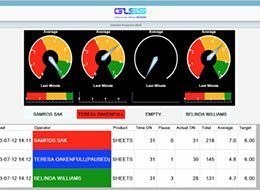 An engineering pause can be selected which will flash monitors and dashboard displays to alert engineering staff. 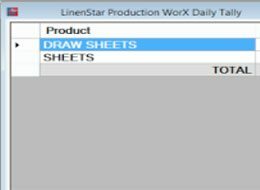 A “Daily Tally” display is available to summarize the day’s output for the workstation. 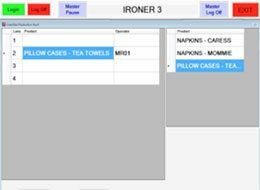 Operators can change products quickly without the need to logout and different products can be processed by different operators at the same workstation simultaneously.